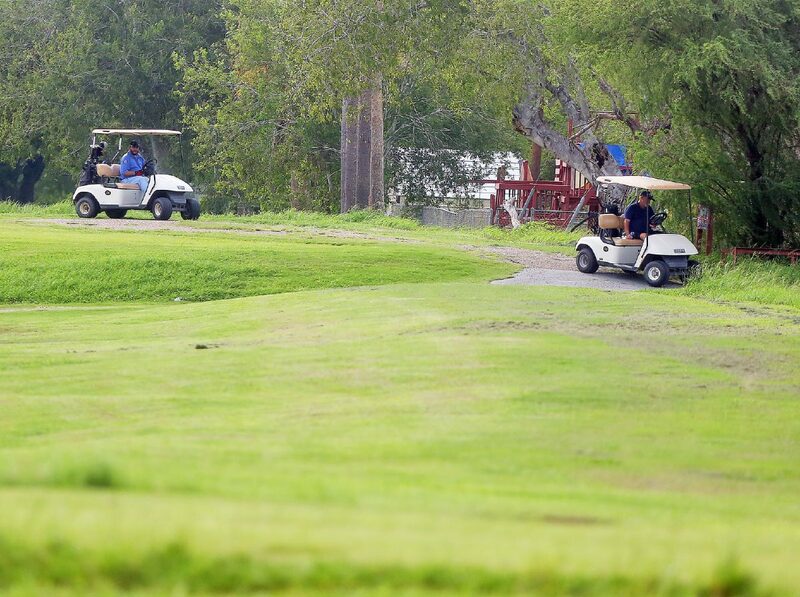 Golfers use their golf carts to make their way through the Ebony Golf course on Thursday, Sept. 20, 2018, in Edinburg. EDINBURG — The mayor pledged $1 million Wednesday to transform Ebony Hills Golf Course into a multi-use park after dozens of residents marched into city hall to stop its potential sale. The course, located at the heart of the city, is a public green space behind the historic Echo Hotel, and residents argued it is one of the few places left downtown where they can find solace in nature. Earlier this month, the council approved an item designating it as surplus property and approved its sale without a broker, allowing the mayor to sign any documents necessary for the sale of the property. When nearby residents heard about it, they passed out fliers and packed the council chambers at Edinburg City Hall, where they waited patiently for over 30 minutes to speak during the public comment section of the meeting Wednesday. They took turns asking elected officials to keep ownership of the course, and suggested transforming it into a park with a golf component. Golfer Chris Quinn putts at the Ebony Golf course on Thursday, Sept. 20, 2018, in Edinburg. 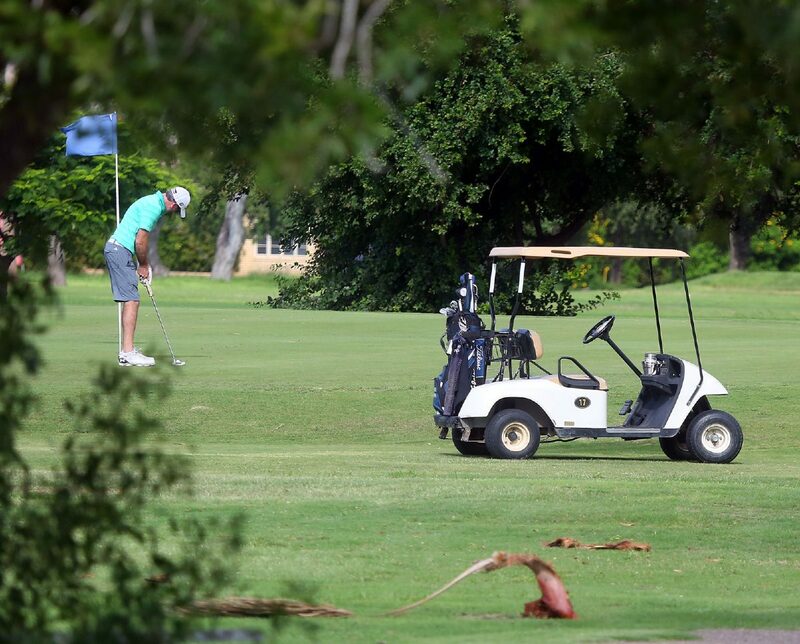 “A nine-hole golf course is hard to find these days,” said Edinburg resident James Evins, who stressed the course attracted Winter Texans to a nearby RV park and birdwatchers to the Echo Hotel. Evins, who went to the podium with the aid of a walker, said he ran the Ebony Hills Country Club in 1947, overseeing the pro shop and serving as a caddie master. The city published a video earlier this week on its Facebook page explaining the three options council members had before them: renovate the course, which they estimated would cost about $6.6 million, transform it into a park or sell it. Ebony Hills runs at a deficit — as most city services do, residents pointed out. According to the video, it generates about $221,000 a year, but its operation amounts to more than $493,000. Still, residents argued, it was worth the quality of life the course provides to those who use it to jog, walk and play golf. A 2005 study commissioned by the Edinburg Parks and Recreation Department found the city lacked community parks, needing an additional 71.8 acres, Edinburg resident Catherine Brush said. And by 2025, it estimated Edinburg would need an additional 175 acres of park space. Adams used her time at the podium to talk about a book she read, called Last Child in the Woods: Saving Our Children From Nature-Deficit Disorder. In it, author Richard Louv presents “cutting-edge research” about how the lack of exposure to nature causes harm to children and society as a whole, she said. Patricia Rubio said her doctor ordered her to walk outside — not on a treadmill or in an enclosed location — when she reached 310 pounds. She started walking at the course and lost 18 pounds. “At the beginning of the year, it was not looking good,” she said about her blood levels. “But now it’s perfect. Mark Peña, an Edinburg attorney, was perhaps the most passionate about the park. He spoke out in 2013 when the city was thinking about purchasing the property from its shareholders and once again defended the green space. After his turn at the podium, the mayor offered him the opportunity to play an active role in the future of the course. Peña agreed to take the lead and the mayor pledged to help fund the project. “I think, Mr. Peña, we had a million dollars for something we were going to do up on the north side. We’ll look at giving you that to start there on the project,” he said. The story has been updated to reflect the correct spelling of James Evins’ last name and minor edits.